Despite El Tri’s 0-3 loss to Sweden, Mexico fans cheered when they learned the team advanced to the next round. The streets of New York City’s Little Mexico neighborhood in East Harlem were mostly empty on a Wednesday morning, but store fronts along 116th Street were dotted with fans tuned in to the Mexico vs. Sweden game. And for a while, the news surrounding the upcoming Mexican elections, the controversy over the separation of families who crossed the border and Pres. Donald Trump's trade war with Mexico were put to the side as Mexico's participation in the World Cup provided uplifting news for many fans. Despite El Tri’s 0-3 loss to Sweden, Mexico fans cheered as they learned that the team advanced to the round of 16, following South Korea's 2-0 win against Germany at the 2018 World Cup in Russia. Mexico’s first World Cup win against Germany resulted in so much cheering that scientists originally thought it had created artificial seismic activity in Mexico City, as fans jumped up and down after Hirving Lozano’s game-changing goal. 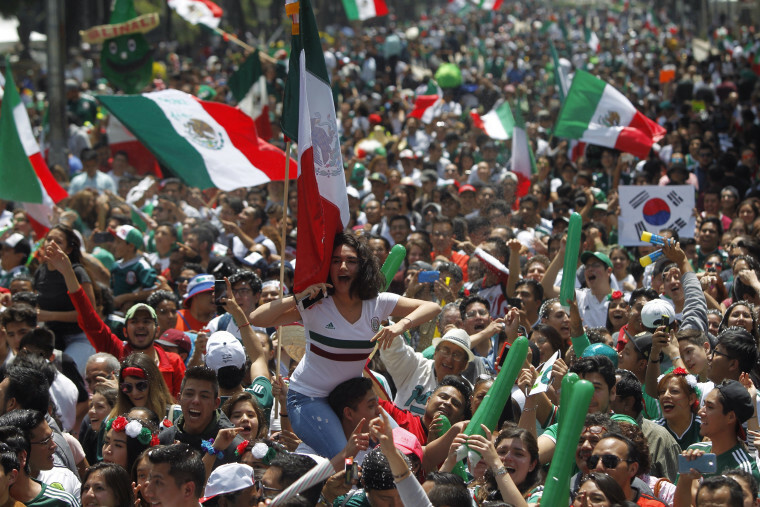 Their win against South Korea continued the pandemonium across the country in a winning streak that provided an escape from the dramatic events at the border for many Mexicans. “I feel guilty that I am paying more attention to soccer than current issues," said Dulce López, 22, who immigrated from Mexico and is a strong supporter of Dreamers and their efforts to seek legal status in the U.S.
Michaela Casemiro, 53, an employee at the Doña Maty restaurant, said she doesn't like what’s happening "with kids" at the border. For the first time since 1986, the U.S. Men's National Team is absent from the World Cup, leaving 325 million Americans divided over who to cheer on. Despite a longtime soccer rivalry and political tensions between the U.S. and Mexico, some Americans have decided to cheer on their southern neighbors. James and Melissa Goodwin, along with their two small children, were walking through midtown Manhattan when they heard fans jumping out of their seats at the “El Sombrero” restaurant. They decided to go in and support the Mexican team. “Well, the U.S. isn’t playing, so I thought, let’s root for Mexico since they’re our neighbor,” said James. “Both of our kids play soccer and all of their teammates are Mexican. We are rooting for them,” added Melissa. But the Georgia couple aren’t the only Americans rooting for Mexico. After receiving negative reactions from soccer fans and players alike, Donovan took to Twitter to explain his actions. “Since the USMNT sadly is not participating in the 2018 World Cup, I am supportive of our CONCACAF rivals and would like to see them do well. If others disagree that is their prerogative… I believe in supporting each other and building bridges, not barriers,” posted Donovan on Twitter.